Two posts in one day, what what what? 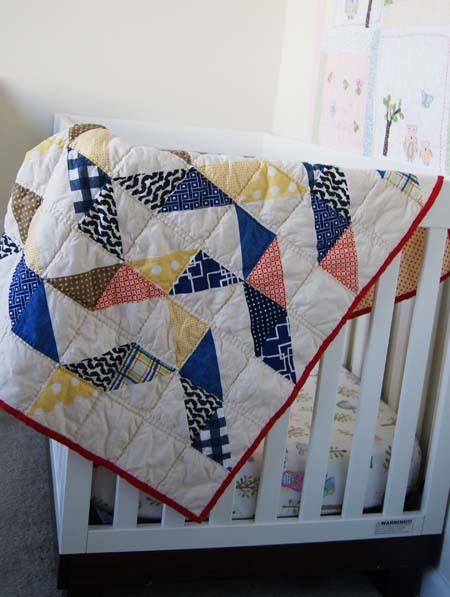 I am super-proud of how this little ol’ baby quilt turned out. Its baby was born this week–it’s a boy! And he has an awesomely classic name! And he’s gorgeous!–so I slapped on the binding, washed it in Charlie’s Soap (best stuff ever for washing baby textiles), and am going to mail it off this weekend. I bound it in red, which was my “girl” plan, but I think red’s okay for a boy, too. And I think the top really needed that extra pop of red, plus a strong framing solid to lend it some structure. I used this design, the navys from my Pink Castle Fabric stash stack (OMG are you doing this yet?! Citron is October and I am almost PARALYZED by my excitement. 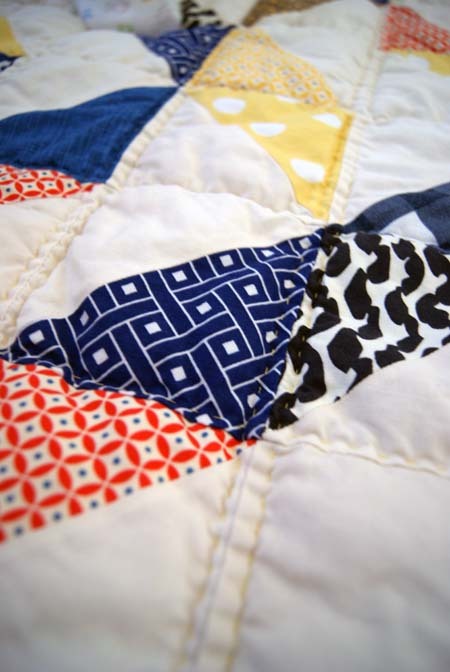 I think you can still sign up, google Pink Castle Fabrics Stash Stack Club…), some Seaside by Riley Blake, some leftover Riley Blake Apple Dot, and one Amy Butler print. And Kona Bone, because I hope this gets barfed on, a lot, and Kona Bone will, I think, wear better than Kona Snow. One last note on fabric choice: that backing is the yellow-red dot from Seaside. It’s astonishing as a big piece. It’s so fine and softly silky as the backing. It may just be my favorite thing about the quilt. Speaking of barfed on, I like to include washing instructions whenever I gift a quilt, particularly a baby quilt. I want people to know that quilts are meant to be used and used and loved, and that yes, they are washable objects. (I remember being afraid to wash quilts, before I started making them.) 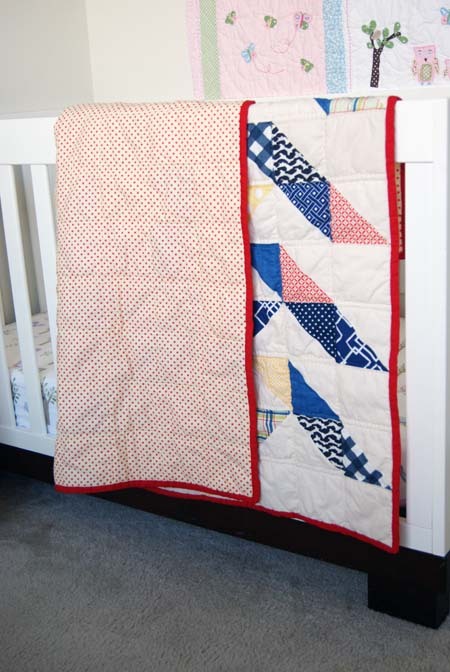 The only real use for a baby quilt is tummy time, and during tummy time there’s always…regurgitation. I hand-quilted this lovely with Gutermann hand-quilting thread in yellow. 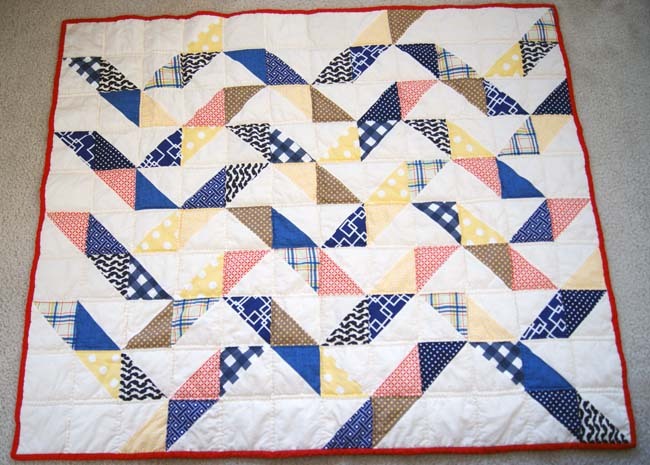 If you’re going to hand-quilt, using a specific hand-quilting thread really does make a difference. And that’s it! I hope the little guy uses it and loves it, and that his momma washes and washes it until the binding starts to fray. I’m posting twice in a day so that I can link up over at Crazy Mom Quilts’s Finish It Up Friday. I had a blast clicking through all the linky party links–head on over and take a look at the lovely stuff everyone is doing out in the quiltosphere! I finished this on time, though, due to toddler tyranny, have not been able to post about it until now. I gave this to a friend for her birthday. You can tell, by the fact that I used up the last of that blue Liberty lawn scrap, that I really appreciate her friendship. Inspiration photo here (if you don’t want to do it wonky like me, BUY rubyru’s pattern. I had teeny tiny scraps and want-needed to do it wonky). Looks pretty fantastic on my busy Pottery Barn duvet, yeah? No excuse. 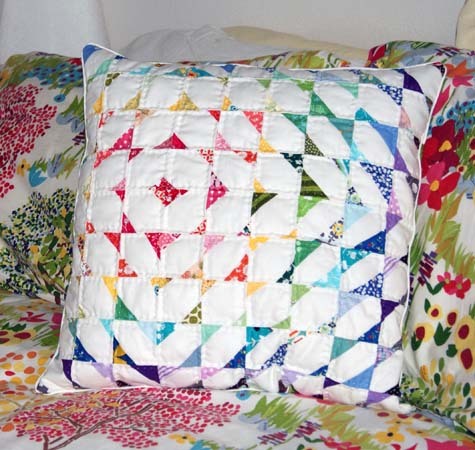 Gotta plan a bed quilt for this fall! but most days, I’m the fence. You know, the one that the velociraptors systematically test for weaknesses? After I got done cleaning up the cottage cheese avocado deli turkey mess that my toddler made at lunch, picked up all the books strewn about the apartment, and put all the foods back in the pantry, I put the little ‘raptor down for a reeeeaaally long nap. And I turned on the TV. And pulled out this little scrappy rainbow pillow top I’m rushing to finish. I’m also trying my hand at blogging from the ol’ iPad. It makes fairly crummy pictures, but on days when I don’t even have the energy to open the laptop (much less find it take a picture upload the picture resize the picture blah blah), I love the ease of snap, blog, and go. 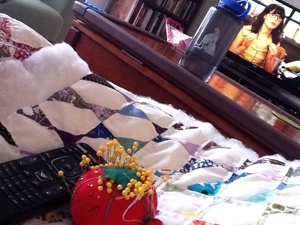 Hoping to have a finished pillow to show off tomorrow, and later this week, a post about holiday crafting!